Commissioner Woody Poitier, Pastor Robert Kintchen and Pastor Gary McLamore will be hosting a breakfast and meet and greet for Whitney Rawls on Saturday, September 6, 2014 at 8:45 am. The breakfast will be held at Bethel A.M.E. Church in Pompano Beach. The effort is not only a show of support for Whitney Rawls but will also be an opportunity for residents to come and meet with Whitney and share their ideas about the future of Pompano Beach’s District 4. All are welcome to attend. Candidate for Pompano Beach District 4 Commissioner. Advocate for social and economic justice and equality, youth and family services. 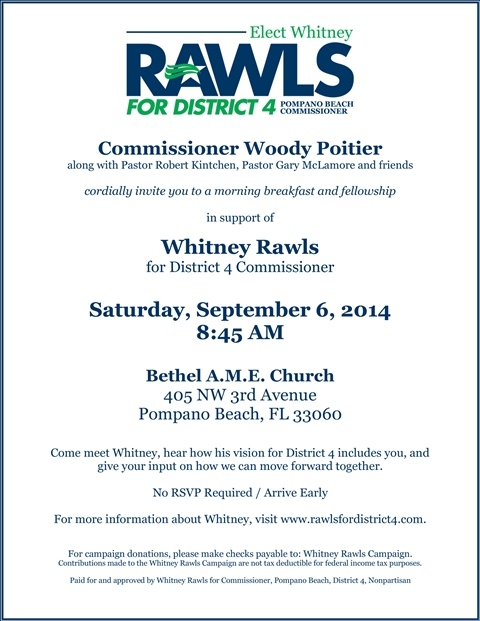 Elect Whitney Rawls for District 4 Commissioner of Pompano Beach.